In the end, my father lost so much that was dear to him: first his home; then his cherished parents and sister who could not understand him. Finally, two months and two days after his thirty-sixth birthday, his life. I believe that his heart was broken by those he trusted, whether that trust was well-placed or not – drug users, hippie friends, and his family – and he lost his will to survive. His only son, named after his father, also died, two months and nine days after his own thirty-sixth birthday. I often wonder if Paul would be alive today if he had been allowed to stay with my father’s sister when he was twelve. Never able to defeat the demons few knew about, Paul struggled for years with an addiction to drugs, and finally gained sobriety nine months before his death from AIDS. Paul lived every minute of his last years with gratitude and love, and he bore the unknowable pain and indignities of a fatal illness with grace, courage and strength. My mother is fragile still, and unable to understand, or take responsibility for, the choices she made as a young mother that left her children vulnerable. His daughters, my sister and I, survived. We have finally learned, although we paid such a high price, to live our lives with joy, strength, dignity and intelligence. I founded a nonprofit organization, named after my brother, and my husband and I travel the world promoting the mission of the organization: to improve health and elevate consciousness worldwide. KayAnne has built a good life for herself as an artist, living with her husband in the mountains of Colorado. I would have loved to ask my father’s sister, the woman formerly known as my aunt, a couple of questions. and not tell my mom? ﻿Amazing Grace Music is an acoustic music shop specializing in guitars, banjos, mandolins, ukuleles, Uilleann bagpipes, etc., in San Anselmo. It’s been there for decades. I brought my father's banjo in to have the owner, John, place the bridge (I tried without luck! ), and tune it up. He expertly put the bridge in, strummed it a bit, and said it was a sweet banjo. He said the pot and the peg head were original, pre-1920, Fairbanks Vega tubaphone, and that the neck was newer, possibly ﻿mid-60’s or so. I know that my father built banjos, and if he built this one, this banjo would be even more special to me! Then he started playing it in earnest, and I quickly picked up my cell phone and to video him playing my father's banjo. Listening to him play brought out strong emotions in me, my father played this banjo in our home when I was a young girl, and John brought it to life! John asked where I got the banjo, and first I told him the story of finding the fifth string peg in Olema, and then I told him how a friend of my father, Jack M., reached out to me on Facebook recently and offered to send me the banjo he bought from my father in 1963. He and his wife (who works there with him) were astonished and delighted. He said that hadn’t heard of my father before, which he attributed to his moving to Lagunitas in 1975, after my father passed away. Then, he exclaimed, “Wait a minute, someone came in to the shop just last weekend, and while we were talking he rattled off a bunch of names of musicians he’d played with in San Geronimo Valley years ago, and J.P. Pickens was one of the names!” He didn’t remember the guy’s name, unfortunately. ﻿ ﻿My father, J.P. Pickens, was a spectacular banjo player, with a soaring, searching intellect. When I was young, his rapid-fire picking floated and shimmered throughout our house. The sweet and tart resonance of the banjo melodies and the joy he felt as he played his music infused our home and lifted the spirits of anyone in earshot. His music comforted me and made me feel safe; when he played his banjo, everything was perfect in my world. J.P. was blessed with the inspiration, creativity and musical chops to seize conventional banjo music, infuse it with new traditions and influences and transform it into new musical forms that still exist today among his musical heirs, which include Bela Fleck, Mumford and Sons, and many more. My father studied music when he was a child in the dusty town of Vernon, Texas, a small agricultural community near the Oklahoma border. His parents insisted that he take piano lessons and he excelled at that instrument. In his teenage years, in Los Angeles, JP discovered an expanded universe of music— classical, jazz, blues, and the traditional folk and hill country music of the banjo. He was delighted by all of it; by the beauty, joy and transformational aspects of sound itself—the music of the hollers, cities and towns of America and the world, of overheard conversations, of motors and clanging metal, and the sacred symphonies of nature. He discovered the banjo, and in that instrument discovered also the perfect expression for his creativity and joy. Many of his friends were musicians, and as my sister and brother and I grew older their visits to our homes were a constant. These creative men and women would come to our home and jam and sing with my father for hours. His happiness, and theirs, was palpable, and wrapped us all in the joyous embrace of love and connectivity, during those times. The music carried their love and virtuosity out into the heavens like prayers. My father taught himself to build banjos, first in his living room in Topanga Canyon, and then, after we moved to Lagunitas, in his woodshop, and soon his life was immersed in the instrument: he traded banjos, he sold banjos (Banana of the folk/rock group Youngbloods bought one) and he began to teach banjo music. In 1962, J.P. and David Meltzer brought their unique, avant-garde music to the San Francisco Coffee Gallery, confounding the crowds who arrived anticipating a conventional ‘Hootenany.’ David and J.P. were sometimes joined onstage by James Gurley, who later co-founded Big Brother and the Holding Company. In 2009, I reached out to James Gurley, and had several wonderful telephone conversations with him. He remembered my father fondly, and he told me that my father and his music had influenced and inspired his own, and had helped to shape and define the San Francisco psychedelic music genre that, not long after the Coffee Gallery days, swept the nation. A deeply generous soul, James had offered to give me a tape recording he had of an early performance of my father, David Meltzer and James backing Janis Joplin at an early Sixties performance at the Coffee Gallery. Unfortunately, days before our scheduled meeting, James suffered a fatal heart attack and the tape disappeared. 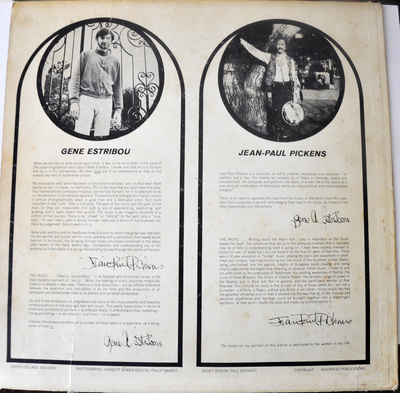 In 1964, my father (who was also a master carpenter) helped his friend Gene Estribou build a recording studio in the attic of Estribou’s home, in the old Spreckels Mansion on in the Haight Ashbury district of San Francisco. In this studio they recorded an album which they named Intensifications— Gene playing acoustic guitar on one side, and my father playing banjo on the other. (In this same studio in1965 Gene recorded the Grateful Dead’s first single.) It was a grand house, and I remember playing in the attic while they were building the recording studio, and then later when they were recording their music. I still have vivid impressions of dark wood and honey-colored lighting, and a secure and comfortable place to sit and read while my father and Gene worked. 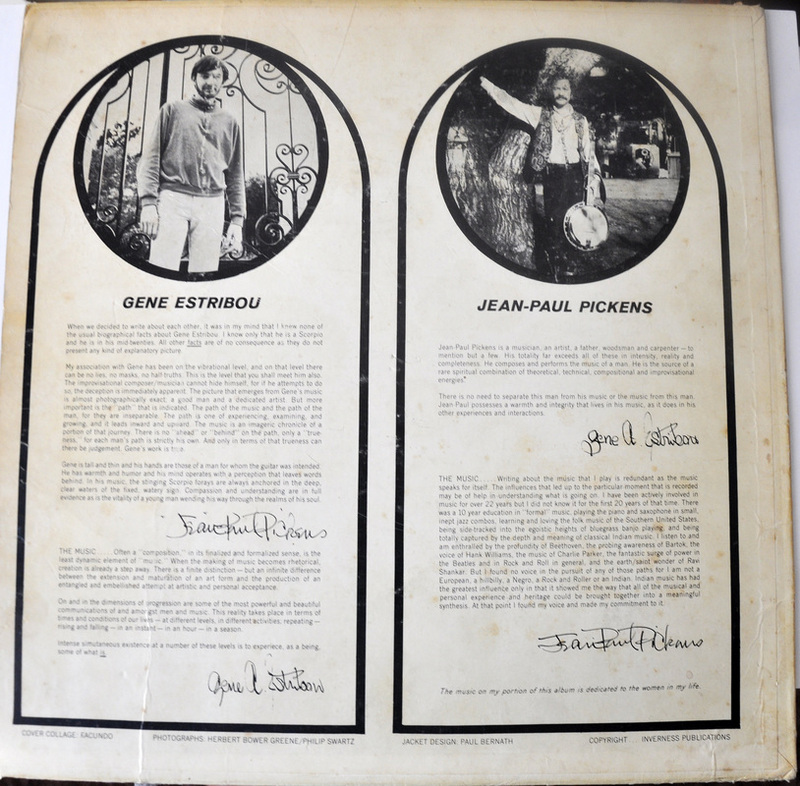 …..Pickens' portion of the record smokes from the start. On "Coo Coo Bird", Pickens begins with a wash of strings before launching into some swift and hyper-rhythmic but still remarkably melodic Americana banjo. Burner "Shady Grows" sounds like a Celtic woodwind ditty performed at Rescue Ranger speeds, albeit also with a high degree of melodic retention. And the sprawling "G.R." is Pickens' answer to the variety of playing styles Estribou displays on "Eeee Minor", as he places non-gimmicky rubato one-liners between dense, swift packets of terrific strumming. In a fictitious world where virtuoso folk guitarists contest for title belts, "G.R." would cinch Pickens' victory over Estribou. But there's no need for a grudge match here: Intensifications features impressive performance from both artists. 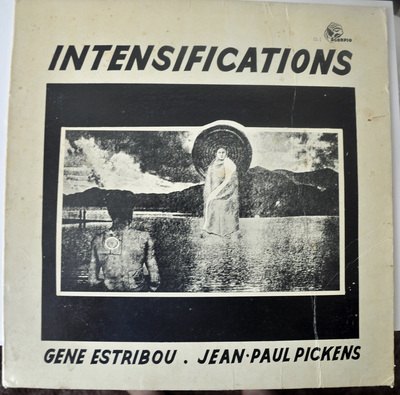 When I told my mom that some reviewers were noting that one of my father’s songs on the Intensifications album appeared to be played “at warp-speed”, she laughed delightedly and informed me that Gene had sped up the tape so that all of J.P.’s songs could fit on the record. My father pushed the limits of banjo music farther than anyone else at this time. 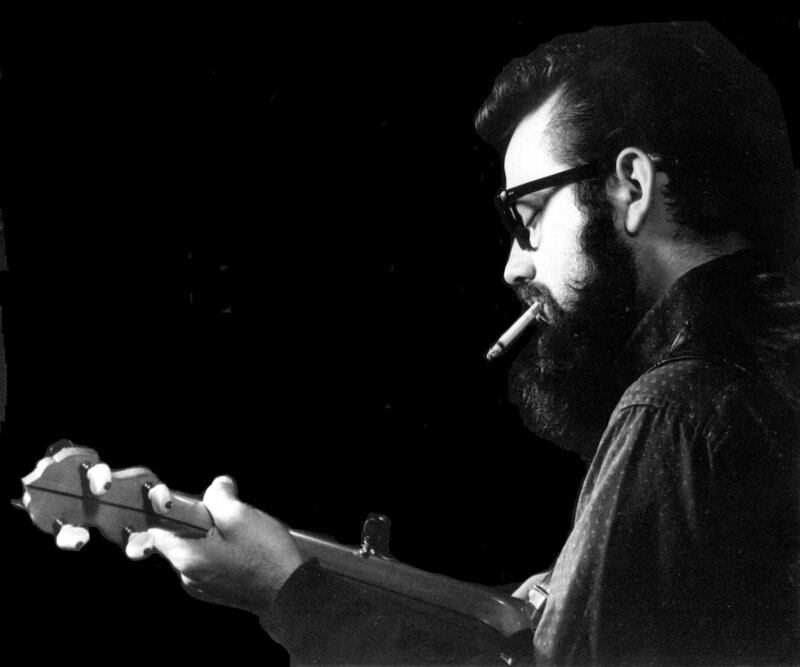 In 1965, he equipped his banjo with electric pickups—something of a “first” for the instrument. In 1966, David and his wife Tina were recording an album and asked JP to back them up with his electrified banjo on one song. 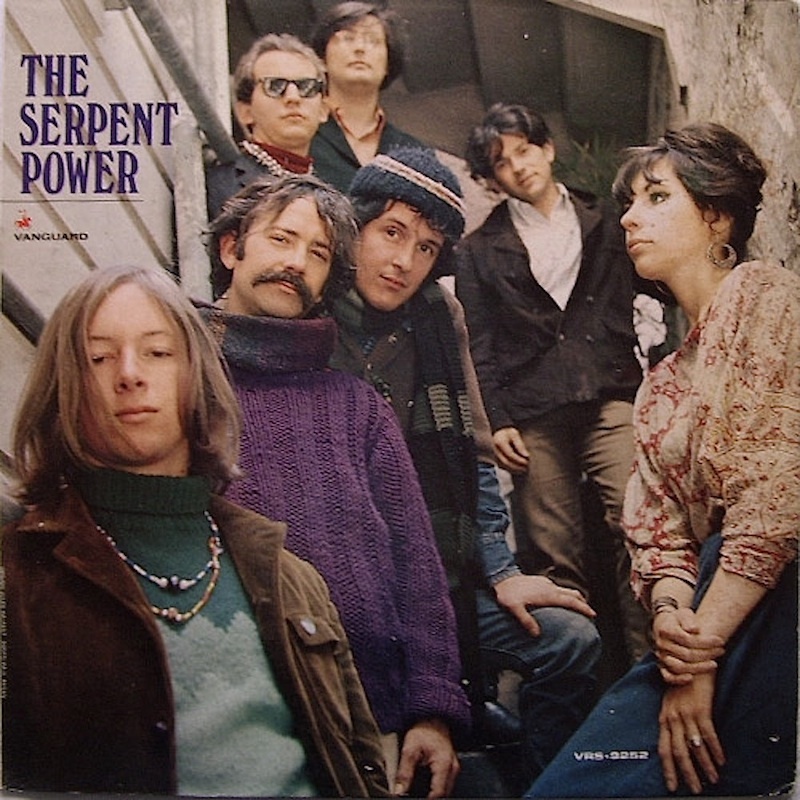 The album, ‘The Serpent Power,’ achieved cult status and in 2007 Rolling Stone Magazine published a special Summer of Love issue, and quantified ‘The Serpent Power’ as number 28 on their list of ‘40 Essential Albums of 1967,’ making special mention of the song “The Endless Tunnel,” featuring my father’s electrified banjo. On July 6th, 1973, I was sixteen years old when my father died suddenly and tragically. His death broke my heart and his absence has been an intense ache. Thirty-eight years later, in the fall of 2011, my sister and I were revisiting the site of Peter Coyote’s West Marin commune that my family and I had lived on all those years ago. We had never been back in all those intervening years. When we returned we discovered that the land become a part of the Point Reyes National Seashore, all the structures had been razed and nature had taken over and erased many of the foundations. As I wandered around the property with my sister, we recalled buildings that no longer existed, trading long-buried memories with one another. As if that were not enough, I recently discovered that JP had left another, greater gift for us. I did and there was one lone message resting there, dated from the prior year—October 24, 2014. The message was short and astounding. It said. I was a friend of your father back in the 60's. I also have one of his banjos that I bought back in 1963. You might be interested in having it back, and if so let me know and I would be happy to send it to you...Jack M.
This appeared to me as a second miraculous gift from J.P., an event that could only be of God, and so magnificent that it has no measure. Jack, I just now saw this message, it was stuck in my “other messages” box. I would LOVE to have the banjo, thank you so much! I don't have words to say how your message has touched my heart. I can't wait to hear how you knew my father, your memories will be so appreciated! Nice to hear from you. I met your father in 1963 while he, your mother, you, your sister and brother were living in Lagunitas. How I met him, I wanted to learn to play the 5 string banjo and he had advertised as a teacher in the newspaper. I took lessons from your dad for a year or so and used to go to your house for the lessons. I also was with your dad when he bought the 1935 Gibson Mastertone. As you probably have heard he had a 5 string neck made for the pot and played it in coffee houses downtown San Francisco. I was also with your dad when he had his appendix taken out at San Rafael General Hospital. I bought your fathers Vega Fairbanks 5 string at that time. Although I still putter around with my other banjos, when I found you and read your story about your father etc., I thought if you were interested you or your sister probably should have the banjo for sentimental reasons. Anyway, if you are interested or interested in any other info I might be able to help you with, please get back to me. My Email is ………………... Jack M.
Just this morning, Jack told me that the banjo has been shipped out today (July 6th!) and I am eagerly awaiting the arrival of my father’s banjo. The decades-long ache in my heart has finally evaporated, replaced by a sense of connectedness and love watching over me and my sister, reminding us with occasional gifts that he is still there; that he “whispered” “in his former student’s ear, urging him to contact me. He wanted his daughters to have his banjo. ﻿I opened the box, and inside was the original case, in remarkably good condition. I opened the case and found the most beautiful banjo I've ever seen inside. This gift is something I will always treasure. The mother of pearl inlay is remarkable, especially on the peghead. Jack took such loving care of this banjo all these years, and he and his wife sent it to J.P.'s daughters with the purest of intentions, incredible generosity and the largest hearts!